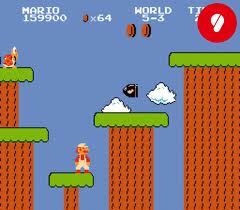 I did a Google search for “Super Mario Screenshots” and this was the inspiration for one of the sides. OK, to get started do a web search for a screenshot that you’d like to replicate or that can at the very least inspire you to put a scene together. Whether its the background or the character placements, sometimes you need a reference point before starting. Draw a quick sketch (my stick figures are top-notch) of the scene before you put start painting. I suppose that if you wanted to give your piece of furniture a proper canvas, you might want to consider sanding and/or priming the surface before painting, depending on what material you’re painting on (but don’t ask me, this is my first attempt at painting furniture, so I just went for it). When you’re satisfied with your sketched idea, grab your paintbrush and your main background color (in this case blue) and paint the side where you plan to put this image. I did multiple coats of blue paint because I became obsessive with not wanting to show the brush marks – maybe a foam roller might be better to avoid this, but I can’t guarantee it. Once you’re happy with the look grab a ruler and pencil to draw the outline of your scene. I used the paint stirrer stick that the guy at Lowes gave me when I chose my paint. That came in handy to do the trunks and to measure out the green tops. To measure out the green tops I just made the width double that of the paint stirring stick so that it was consistent. To round off the edges was simple, I just grabbed the small tube of paints and used that as my outline on the bottom. They weren’t perfectly even, but it was pretty close. For the knobs on the drawer I had my husband drill holes into the candy tin that lined up with the existing holes of the dresser and just screwed them in. Simple as that.